Garmin International, Inc., a unit of Garmin Ltd. (NASDAQ: GRMN), now has two additions to their outdoor GPS handheld series — the GPSMAP® 66s and the GPSMAP® 66st. These updated premium handhelds bring expanded wireless connectivity, direct-to-device access to BirdsEye Satellite imagery and a larger 3 inch sunlight-readable color display. The GPSMAP 66st offers pre-loaded topographic maps for U.S. and Canada. With direct-to-device downloads via Wi-Fi® or Bluetooth® of BirdsEye Satellite Imagery (no annual subscription needed), users can see high-resolution photo-realistic views of their route. Easily find parks, trailheads, clearings for campsites, stand locations for hunting and more. Plus, the GPSMAP 66st comes pre-loaded with topographic U.S. maps so users can see where they’re headed in more detail, like coastlines, rivers, summits, terrain contours and geographical points. Other new GPSMAP 66s/st connected features include Geocaching Live and compatibility to the Connect IQ platform, giving users access to over 9 million trails through the pre-loaded Wikiloc app. The devices all pair with the inReach Mini, allowing the user to send and receive messages directly on their 66s/st device via the Mini. Between the multi-GNSS satellite support and ABC (altimeter, barometer and compass) sensor capabilities, the GPSMAP 66s/st will track the entire journey. The handheld devices have 16 hours of battery life in full GPS mode and can track the user's position for up to 1 week using Expedition mode on a single set of AA batteries. These devices include an LED flashlight and SOS beacon that can be used to signal for help. In addition to the large 3-inch sunlight-readable color display, it’s built to military standards for thermal, shock and water performance (MIL-STD-810G). Professionals and serious GPS enthusiasts will appreciate the inclusion of RINEX data logging, which allows for sub meter accuracy of GPS position after post processing. 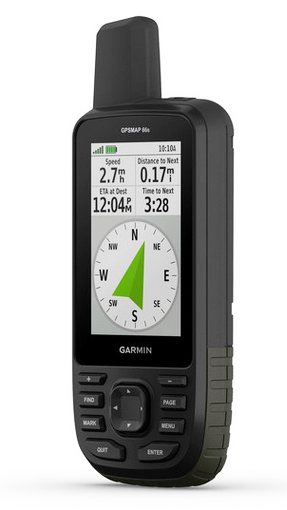 The GPSMAP 66s and GPSMAP 66st are the latest solutions from Garmin’s expanding outdoor segment, which focuses on developing technologies and innovations to enhance users’ outdoor experiences. Whether hiking, hunting, trail running, mountain biking, golfing, diving or using satellite communication, Garmin outdoor devices are essential tools for outdoor enthusiasts of all levels. For more information about Garmin’s other outdoor products and services, go to , garmin.blogs.com and twitter.com/garmin.